Clearwell Castle is a magnificent wedding venue nestled in the Forest of Dean countryside in Gloucestershire. Whilst the castle has acres of grounds and gardens, one of my favourite photos from Helen and Kirk's wedding there came from the bridal suite - but it's not a photo of the bride getting ready, or anyone else getting ready for that matter! The bridal suite at Clearwell Castle has duel aspect views, with the front of the castle and perimeter wall visible from one side, and part of the grounds and the court yard visible from the other. 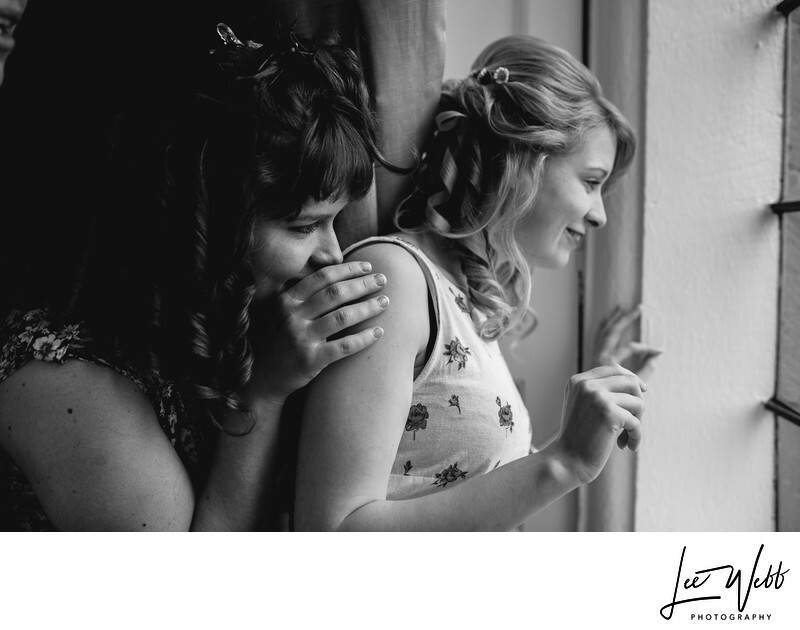 Helen and her bridesmaids were busy getting ready in the Clearwell Castle bridal suite, when her maid of honour noticed that the groom, Kirk, was just arriving in the car park below. Helen was desperate to catch a glimpse of the man she was about to marry, but at the same time was desperate to stick to tradition and not be seen by the groom before the wedding ceremony. 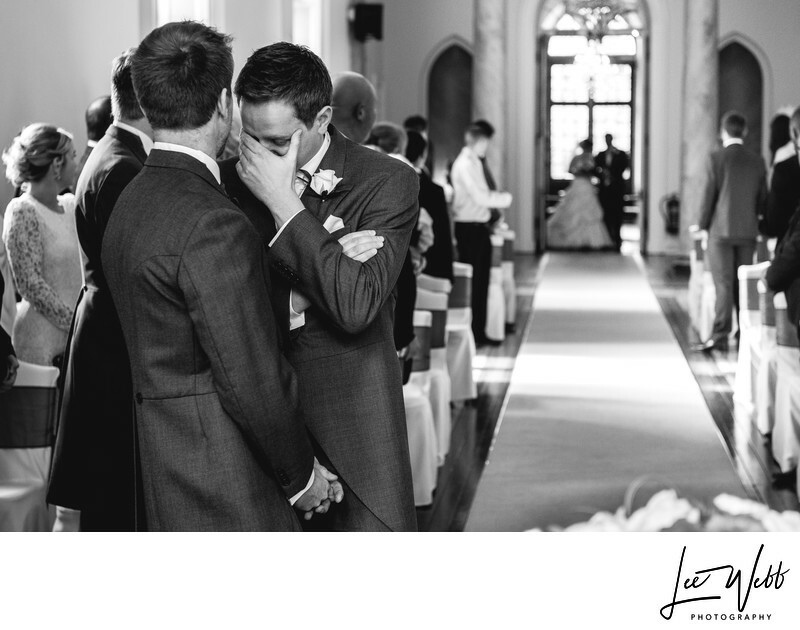 The bride can be seen in this image hiding behind her maid of honour, but sneaking a peak over her shoulder. Her happiness is easy to see by the grin on her face, and the maid of honours excitement is palpable. 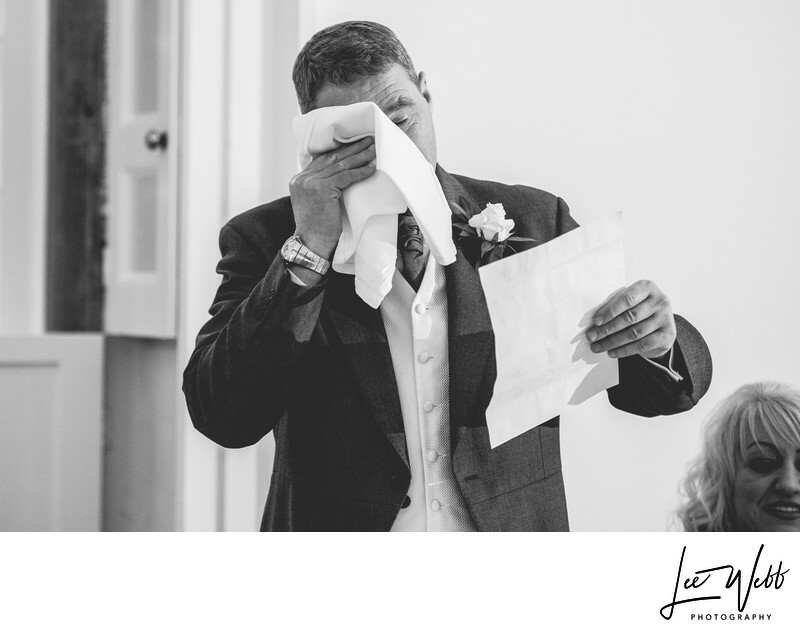 The wedding day itself was rife with emotion from all sides, from the groom's reaction to seeing his bride for the first time in the image above, to the father of the bride's giving his speed in the photo below.